Ever since scoring a breakthrough with 2000’s Memento, Christopher Nolan has been considered to be one of the finest new directors making films at this time. 2002’s remake of 1997 Norwegian film Insomnia ensured Nolan’s place as one of the top new directors as he was selected to revive the Batman film franchise. In 2005, Batman Begins was released to a lot of acclaim as did its 2008 sequel The Dark Knight that is currently the third highest grossing film in the U.S. While 2006’s The Prestige was a break from the franchise that also maintained Nolan’s viability and anticipation running high for the third Batman film. 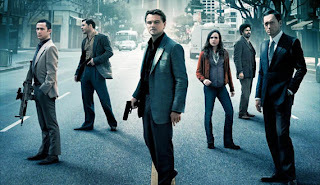 Nolan returns to more original material with a film about mind extractions and other strange occurrences with Inception. Written and directed by Christopher Nolan, Inception tells the story of a man who steals ideas from a company by extracting into their mind. In his job, he is also trying to deal with the death of his wife while hoping to do one last job before returning to his family. During this job, he encounters trouble as he tries to escape from his own guilt and everything else. A psychological drama of sorts mixed in with elements of heist films, Nolan crafts a film with a lot of ambition filled with dazzling visual effects and a complex story line that recalls some of his early films. Starring Leonardo DiCaprio, Joseph Gordon-Levitt, Marion Cotillard, Ellen Page, Tom Hardy, Tom Berenger, and Pete Postlethwaithe. The film also stars such Nolan regulars as Ken Watanabe, Cillian Murphy, and Michael Caine. Inception is a remarkable, visually-stunning film from Christopher Nolan and company. Dom Cobb (Leonardo DiCaprio) is at a party for a Japanese businessman to talk about his job which is to extract ideas from other people’s minds. Joining Dom is his right-hand man and researcher Arthur (Joseph Gordon-Levitt). At the party, Dom sees his wife Mal (Marion Cotillard) where things go wrong. All of a sudden, Dom and Arthur have woken up in the middle of another world with Saito and an architect named Nash (Lukas Haas). When it is revealed that Saito really has nothing to be extracted from, it is clear that Saito used Dom and Arthur as an audition for what he really seeks. He wants to inject an idea into the mind of a corporate rival which is known as inception as he offers Dom something he couldn’t refuse. The offer was for Dom to finally return to America if he takes the job. Dom’s inability to return to the U.S. to return to his kids was due to the death of his wife whom he’s been seeing frequently in his own dreams. Seeking guidance from his father-in-law and mentor Miles (Michael Caine), Miles gives Dom a new architect to work with in a young student named Ariadne (Ellen Page) who becomes part of his new team. Learning about how to construct dreams, Ariadne enters into a new world as she is joined by a forger named Eames who takes on various disguises and a chemist named Yusuf (Dileep Rao) who has created a powerful sedative for deep dream sleep. Saito joins the team as Arthur finds the target in Robert Fischer (Cillian Murphy), the son of Saito’s corporate rival Maurice Fischer (Pete Postlethwaithe), who is currently dying. During the planning, Ariadne learns of Dom’s troubles as she would often see Mal or something from Dom’s memories into his subconscious as he could be a liability to the upcoming mission. Realizing that Ariadne is the one who knows what might’ve happened, Dom realizes that he needs her to keep him on check. With the entire team including Saito boarding a 747 plane with Robert Fischer on board, Fischer gets drugged as the whole team goes into his subconscious. Upon their arrival into Fischer’s subconscious, trouble ensues as they realize that Fischer has put some defenses. After kidnapping Fischer in his own subconscious, Eames disguises himself as Fischer’s godfather Peter Browning (Tom Berenger) to get some information. Instead, it becomes more troubling as Fischer and the team have to go into another subconscious with Yusuf keeping an eye out for trouble. Inside becomes more complicated as Dom and everyone goes into levels of subconscious minds to get what’s inside the safe of the Fischer family. Yet, Dom becomes more troubled by his own past and the presence of Mal as he confesses his own guilt as he realize what he must do. For a film as ambitious and complex as Inception is, what is more surprising is how simple the plot of the film. It’s about a man doing one more heist job by going into someone’s mind so he can go home. While that plotline seems simple, nothing in the mind of Christopher Nolan is simple as he fleshes out ideas that are truly complex and layered. Notably for the fact that he takes the audience into a journey that revolves around a man’s guilt as well as his attempts to break into people’s minds. While the screenplay and concepts recall some of the work of Charlie Kaufman, Nolan creates a story where he distorts the idea of where people are at. The film starts with a sequence of Cobb arriving into the home of an old man which would be revisited towards the end. Yet, it cuts to a scene of Cobb at a party with Arthur and Saito where the audience thinks its real. Then comes the realization that they’re all in someone’s subconscious and then what is going on now is someone else’s subconscious. While at first, what happens is hard to follow. Nolan is just giving the audience an idea of what is real and what is fiction. Immediately, the audience gets a chance to figure things and there’s a character that sort of becomes their guide in the form of Ariadne, the new member of Cobb’s team. Ariadne is one of several supporting characters that does get a chance to stand out as she doesn’t just serve as a Greek chorus in a way for the audience. She is also the one person who goes deeper into Cobb’s mind and tries to help him deal with it. While another supporting character in Arthur does have an idea about Cobb’s state of mind, he only backs away just so he can do his job. Arthur, like Cobb, does become a mentor for Ariadne so she can be guided into what subconscious she’s in. Others like Saito, Fischer, Yusuf, and Eames don’t get as much development yet they’re characters that audiences do get to care about and get to know them a bit. Yet, it’s Cobb that is the man that drives the film as he is dealing with his own guilt over his wife’s death as well as his reasons to want to go home. When the audience is introduced to Mal, we see a woman who seems angry yet there’s a reason for her anger that is rooted in what Cobb might’ve done to her. If Nolan’s creation of characters, environments, and how they interact to the different subconscious worlds they’re in. It’s Nolan’s direction that really takes the story to a level that is truly stunning. When the film is shown, it’s clear that Nolan uses his ambition to tell a story that is truly mesmerizing. In creating cities and places where things can fold on top of another or action sequences that involves a fight where the hallway is spinning around. Nolan is going for tricks where he doesn’t have to use CGI entirely by getting sets built and actually make sure it doesn’t look it’s being made by computers. Nolan still utilizes certain framing styles and compositions along with close-ups and zooming shots to make audiences know that they’re watching a Christopher Nolan film. Still, it’s clear that the film the audience is watching is by a director who is refining his craft while learning new tricks to create something that is fascinating and jaw-dropping. Even in the visual-effects driven sequences about the recreation of cities where there’s a scene where a city folds on top of itself that looks truly amazing. Even as he uses visual effects for more than just spectacle but use it as a form of storytelling. What Nolan does overall with the film whether its creating high-octane action sequences reminiscent of chase movies or even James Bond-inspired action sequences. Even if it’s just a simple scene where they set up the heist. This film proves that Nolan is clearly at the top of his game as he is becoming one of the best filmmakers working today. Nolan’s longtime cinematographer Wally Pfister does spectacular work with the film’s lighting design and visual look. Pfister’s photography is stunning in its wide scope along with dark shades for interior and exterior scenes to create a chilling mood. For the first inception subconscious sequence in the rain, the look of the film is dark but also pristine but without any kind of polish. It’s truly some of the best photography captured on film as Pfister is definitely becoming one of the best cinematographers in the business. Another noted Nolan collaborator in Lee Smith does some fantastic work with the film’s editing. Taking on a mostly, leisurely pace for a majority of the film so it can move quite seamlessly without anything moving very fast or going too slow. Smith pretty much slow things down once the action sequences are done so audiences can have a breather. There’s even dramatic scenes where the cutting is fast but only to intensify what is happening in the heist while the action is fast but not hyperactive so the audience can have an idea of what is happening. The work that Smith puts into the editing is masterful and an example of how it should be done. Production designer Guy Hendrix Dyas, along with set decorators Larry Dias and Doug Mowat plus supervising art director Brad Ricker, does amazing work with set design for the film. While some of the film is shot on location in Tokyo, Paris, Los Angeles, Tangiers, parts of England, and in Canada. Many of the interiors for some of the subconscious scenes, including the zero-gravity sequence, were built with a look that is polished but not in a bloated manner. The designs of the buildings and for Saito’s Japanese style home is superb as the art direction is truly stunning. Costume designer Jeffrey Kurland does some excellent work with the look of the costumes that complement the visual look of the art direction. While a lot of the clothes is mostly casual in several scenes. Some of the scenes have the characters were suits or evening gowns to convey the sense of atmosphere in the subconscious the characters are in. Visual effects supervisor Paul J. Franklin is phenomenal in the use of CGI that doesn‘t look fake. For several of the subconscious-driven sequences, notably the folding building scene. Franklin, along with his team, succeed in not going overboard in visual effects as it’s an example of how it should be done. Sound designer Richard King does amazing work in the film‘s sound editing and design to create broad layers for the locations the characters are in. Notably the action scenes that are layered with sounds of heavy rain, tire squeals, gunshots, and trains railing on the ground as the layering is phenomenal. King’s work is definitely another of the film’s technical highlights. The film’s music by Hans Zimmer is a haunting yet eerie score piece that is filled with broad orchestral arrangements mixed in with down-tempo yet smooth electronic textures. Adding flourish to the sound on guitar is legendary guitarist for the Smiths in Johnny Marr. The guitar textures Marr brings to Zimmer’s score is incredible while the rest of the soundtrack includes the drone-based score music of Zack Hemsey and the Edith Piaf song Non, Je Ne Regrette Rien that’s played throughout the film. The casting by John Papsidera is definitely spellbinding as it‘s definitely one of the best ensemble cast team ever assembled. Small roles from Claire & Taylor Geare as different ages of Dom’s daughter Phillipa and Magnus Nolan & Taylor Geare as his son James are excellent for their small, face-less appearances. Others include Talulah Riley as a blonde in a subconscious fantasy scene and Tai-Li Lee as a man who helps people sleep longer in a brothel of sorts. Notable small but memorable appearances include Lukas Haas as Nash, an architect in an early sequence while Michael Caine makes a cameo appearance of sorts as Dom’s father-in-law/mentor who gives him advice about what to do. Tom Berenger is very good as Fischer’s godfather who tries to go into the secret code of Fischer’s vault while Pete Postlethwaithe is also good as Fischer’s hardened father whom Fischer has a strained relationship with. Dileep Rao is excellent as Yusuf, a chemist who helps Dom and the team in their mission by creating a sedative for long sleeps while they’re on the job as he also gets in the action for a brilliant car chase scene. Tom Hardy, of Bronson fame, is great as Eames. A humorous forger who takes on various disguises while being the guy who goes into the action and be the shooter as Hardy’s performance is a real standout. Cillian Murphy is wonderful as Robert Fischer, the target of the inception who wonders what’s going on as he ends up becoming part of team despite his reluctance. Ken Watanabe is brilliant as Saito, the businessman who hires Dom for the inception as he also takes part in the action not knowing about the stakes of what has to be done. Marion Cotilliard is phenomenal as Mal, Dom’s deceased wife who appears in Dom’s subconscious and others who seems to have a vendetta over the idea that Dom has abandoned her. Cotillard’s performance is definitely complex as a woman who has no idea what happened to her but is determined to get into Dom’s head. Joseph Gordon-Levitt is great as Arthur, Don’s right-hand man and researcher who helps organize the job while taking in part of the action. Gordon-Levitt proves to be able to stand with the likes of DiCaprio while getting involved in one of the film’s best action sequences as it’s another solid performance from the young actor. Ellen Page delivers what is probably her best performance to date as Ariadne, the new architect for the team. While not displaying the wit she had in Juno a few years ago, it’s definitely a more mature performance as she plays the observer and conscious of sorts. Even as she plays DiCaprio’s anchor where she shows her true dramatic talents in working with DiCaprio as it’s definitely a winning supporting turn. Finally, there’s Leonardo DiCaprio in what is definitely one of his greatest performances to date. In the role of Dom Cobb, DiCaprio brings a tour-de-force performance as man struggling to get home while dealing with the death of his wife. There’s a sense of restraint and anguish to his performance while maintaining a sense of professionalism when he’s on the job. DiCaprio definitely shows his presence in doing physical stunts and such while he has a great camaraderie with the entire cast. It’s clear how far DiCaprio has grown as an actor since the days of Leo-mania when Titanic was the highest-grossing film of all-time back in 1997. His role as Dom Cobb proves that Leonardo DiCaprio is becoming one of the best actors working today. Inception is a marvelous yet jaw-dropping film from Christopher Nolan and company. Featuring amazing technical work and a solid ensemble cast led by Leonardo DiCaprio, it’s a film that definitely that challenges the audience of what can be done with a blockbuster. Particularly in an era where 3D and low-concept films with silly gimmicks are expected to bring asses in the seats. Fortunately, Nolan nor his cohorts believe in that as Inception is a film that is smart enough for audiences of moderate taste that they can follow. In the end, Inception is a remarkable film that shows that ambition doesn’t have to be presented with loads of CGI and gimmicks. All that is needed is a story and a vision that is unique as it comes from the spectacular mind of Christopher Nolan. Due to some situations relating to Epinions.com, which has become an un-enjoyable to work at. I will finally be posting some new reviews here just for the time being. There will finally be some reviews though not frequently for now.